Coriander | Become Healthy or Extinct! Coriander, commonly known as Kothmir or Dhania in the Indian subcontinent or Cilantro in other continents, is a herb that is extensively used around the world as a savory condiment or a garnish in many dishes. Its scientific name is Coriandrum Sativum Linn. Coriander contains vitamin A, vitamin C, vitamin E, vitamin K, thiamine, riboflavin, pyridoxine, pantothenic acid, niacin, folates, zinc, calcium, iron, phosphorus, selenium, magnesium, manganese, carbohydrates, protein and dietary fibre. It has eleven components of essential oils, six types of acids, including ascorbic acid (vitamin-C), minerals and vitamins, each having a number of beneficial properties. The health benefits of coriander include treatment of swellings, high cholesterol levels, diarrhea, mouth ulcers, anemia, digestion, menstrual disorders, small pox, eye care, conjunctivitis, skin disorders and blood sugar disorders. Coriander is anti-inflammatory, so it helps soothe ulcers, inflammation, spasms, rheumatoid arthritis and crohn’s disease. It also protects and soothes the liver. It is anti-carcinogenic and its anti-oxidant properties are known to prevent certain types of cancers. Coriander is anti-convulsant, anti-histaminic and hypnotic as well. It is also believed to be a natural aphrodisiac and previously it was extensively used in certain preparations, combined with other herbs, to enhance libido. Borneol, which is a form of alcohol that is contained within this herb, prevents people from getting colds and the flu because it kills the bacteria and viruses that cause them. This herb also helps lower the level of bad cholesterol and increase the levels of good cholesterol in the body. It is also known to detoxify dangerous metals such as such as mercury, aluminium and lead from the body. The best way of deriving the benefits of coriander would be to use its leaves and stalks in your green vegetable juice or in your fruit and vegetable juice. Sprinkling its raw leaves over many cooked dishes is a norm, but the benefits derived depend on which food groups are contained in the food. Swellings: Cineole, one of the 11 components of the essential oils, and linoleic acid, present in coriander, possess anti rheumatic and anti arthritic properties, which are very beneficial for swelling caused due to these two reasons. For others, such as swelling due to malfunctioning of kidney or anemia, it is seen to be effective to some extent, as some of the components help excretion of extra water from the body while. High Cholesterol Levels: Some of the acids present in coriander viz. linoleic acid, oleic acid, palmitic acid, stearic acid and ascorbic acid (vitamin-C) are very effective in reducing the cholesterol level in the blood. They also reduce the cholesterol deposition along the inner walls of the arteries and veins. Diarrhea: Some of the components of essential oils in coriander such as Borneol and Linalool, aid digestion, proper functioning of liver and bonding of bowels, helping cure diarrhea. It is also helpful in diarrhea caused by microbial and fungal action, since components like Cineole, Borneol, Limonene, Alpha-pinene and beta-phelandrene have anti bacterial effects. Mouth Ulcers: Citronelol, a component of essential oils in coriander, is an excellent antiseptic. In addition, other components have anti microbial and healing effects, which do not let wounds and ulcers in the mouth go worse. They aid healing up of ulcers and freshen up the breath. 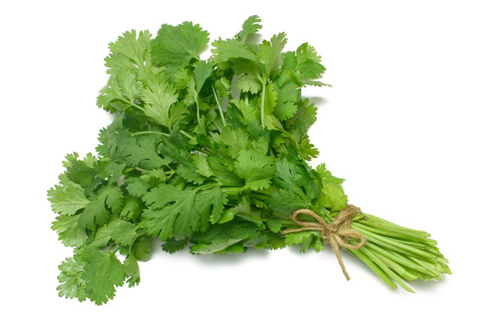 Anemia: Coriander is good in iron content which directly helps curing anemia. Digestion: Coriander, due to its rich aroma because of its essential oils, apart from being an excellent appetizer, helps in proper secretion of enzymes and digestive juices in the stomach, stimulates digestion and peristaltic motion. It is helpful in treating problems like anorexia. Small Pox: The essential oils in coriander are rich in anti microbial, anti oxidant, anti infectious and detoxifying components and acids. The presence of vitamin-C and iron strengthen the immune system too. These properties help prevent and cure small pox. They also reduce the pain and have a soothing effect on pox patients. Menstrual Disorders: Being stimulating in nature and helping proper secretion from the endocrine glands, it also helps proper secretion of the hormones and thereby inducing proper menstrual cycles and reducing pains etc. during periods. Eye Care: Coriander has lots of anti oxidants, vitamin-A, vitamin-C and minerals like phosphorus in the essential oils in it, which prevents aging of eye, macular degeneration and soothes eyes against stress. Conjunctivitis: Coriander is a very good disinfectant and has anti microbial properties, which protect the eyes from contagious diseases like conjunctivitis. Skin Disorders: The disinfectant, detoxifying, anti-septic, anti-fungal and anti-oxidant properties of coriander are ideal for curing skin disorders such as eczema, dryness and fungal infections. Blood Sugar: Due the stimulating effect of coriander on the endocrine glands, the secretion of insulin is increased from pancreas which increases the insulin level in the blood, thereby helping proper assimilation and absorption of sugar and resultant fall in the sugar level in the blood. This property is very beneficial for the diabetes patients and others too. under the page about coriander, under skin disorders, the text mentions cumin instead of coriander…is it a typo? Yes Arati, it was a typo. Thank you for bringing it to my notice.